OK, remember a few days ago, when we were discussing the coordinated Republican campaign to kill the Mueller investigation, and how I mentioned that the President of Fusion GPS, the research firm responsible for having commissioned the so-called Steele Dossier back in 2016, was demanding that members of the Senate Judiciary Committee release the transcript of his August 22, 2017 testimony before their committee? Well, this afternoon, things took an unprecedented turn. Democratic Senator Diane Feinstein decided to release the transcript herself, disregarding the objections of her Republican colleagues. [“The American people deserve the opportunity to see what he said and judge for themselves,” Feinstein said today in a statement.] And, now, like many folks around the country, I’m slowly making my way though the ten hours of back and forth between Glenn Simpson of Fusion GPS and investigators working on behalf of the Senate Judiciary Committee. As I’m sure you can get better coverage elsewhere on the finer points, I’ll just share my first half dozen observations. And, by the way, I may get some of this wrong, so please feel free to challenge my interpretation of this stuff. The Republicans, I think it’s pretty clear, felt their best chance of stopping the Mueller investigation was to make it look as though the whole thing was a politically motivated attack. And they created a narrative to accomplish that. The story, as they told it, started with Hillary Clinton paying to have a fake dossier written about Trump, which was then handed over to members of Department of Justice who were loyal to Obama, who, in turn, brought Mueller on board to open a sham investigation, or “witch hunt”. But, as we now know for a certainty, absolutely none of that was true. While the Clinton campaign and the Democratic National Committee did begin paying Fusion GPS in April of 2016 to continue their work, the company’s research into Trump, and his ties to Russian organized crime, started during the Republican primary, when the services of the DC-based research firm were retained by the Washington Free Beacon, a conservative website. Furthermore, as we now know, it was not the Steele Dossier that caused for the investigation to be initiated, but a tip from an Australian diplomat by the name of Alexander Downer in London, who had heard about the Russian hacking campaign against Clinton from Trump advisor George Papadopoulos over drinks. 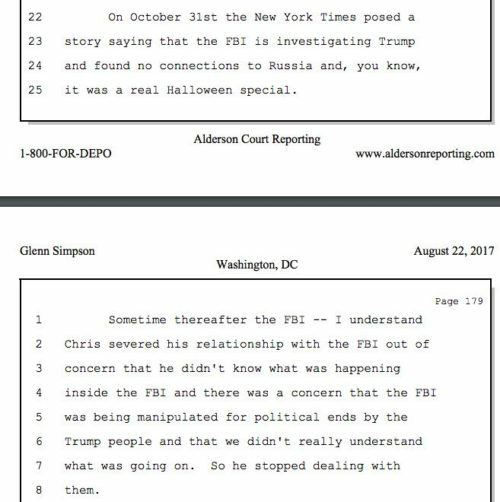 And, of course, there’s also the fact that, according to Simpson, the idea to turn the dossier over to the FBI didn’t come from the Clinton campaign, but from from former MI6 agent Christopher Steele, who had authored the report, and was concerned that Putin might have kompromat (“compromising material”) that could be used as leverage against candidate Trump. Here are two clips from the Simpson testimony. Steele, according to Simpson, would brief the FBI twice about his findings, first in an early July 2016 meeting that the former British agent had requested, and again in September 2016. This second meeting, according to Simpson, took place in Rome, and was called by the FBI. In spite of this, however, Steele didn’t see much action on the part of the FBI, and stopped working with them on October 31, 2016, after reading a New York Times article titled “Investigating Donald Trump, F.B.I. Sees No Clear Link to Russia.” It was that point, according to Simpson, that Steele became “concern about what was going on at the FBI.” The following comes from Politico. The Times story reported at a critical moment in the 2016 election campign that the FBI had found no “conclusive or direct link between Mr. Trump and the Russian government” during a months-long inquiry. The story has come under fire in light of subsequent reporting, much of it by the Times’ own reporters, detailing contacts between the two. Simpson testified that the article contradicted Steele and Fusion’s own research into Trump’s connections with Russia. One of the things that I find most interesting about all of this is the fact that Fusion GPS, prior to working on this project, which, of course, they outsourced to Steele’s company (Orbis Business Intelligence), was working on behalf of the Russians to overturn the Magnitsky Act sanctions. Here’s a tweet from earlier today by Magnitsky friend Bill Browder, the Head of Global Magnitsky Justice campaign, and Author of the book Red Notice. [If you’re not familiar with the story of Sergei Magnitsky, I’d suggest you do some reading, as it’s really central to this whole story.] So, again, this really isn’t a situation where a left leaning entity was working to politically undermine Trump. Simpson, for Chrissake, was a journalist for the conservative Wall Street Journal before launching his own company, and doing work for the baddies. ‏A few days ago, in an attempt to slow down the investigation, Senators Chuck Grassley and Lindsey Graham referred Christopher Steele to the Justice Department for criminal investigation. The implication, of course, was that Steele had someone broken the law in the way in which he handled this report. 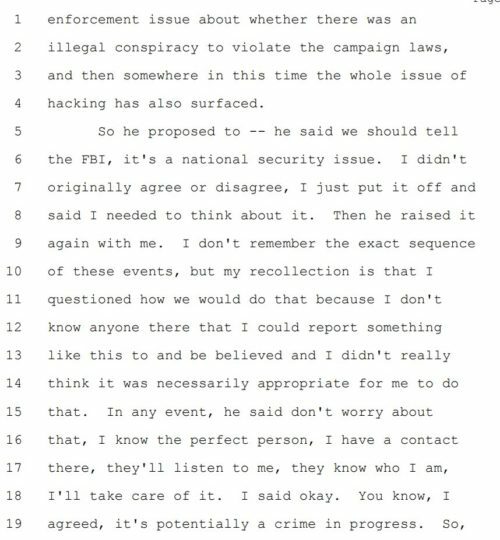 Having now read the transcript, though, it’s difficult to see how anyone could come to that conclusion, which I’m sure it why Feinstein released them. The Steele allegations of money laundering and conspiracy were credible, and yet the Republican members of Congress fought to keep this investigation from going forward, going so far as to suggest ulterior motives on the part of Steele, who, as far as I can tell, cares more about the security and stability of our country than any Republican on Capitol Hill… As Congressman Ted Lieu said today, “the Fusion GPS transcript shows that what Senators Grassley & Graham did last week in publicly referring Christopher Steele for criminal investigation was, at best, a partisan publicity stunt and, at worst, intentionally designed to mislead the American people.” To put a finer point on it, on August 22, 2017, members of Congress knew for a certainty that the Department of Justice investigation into Trump did not have it’s origins with the Steele Dossier. 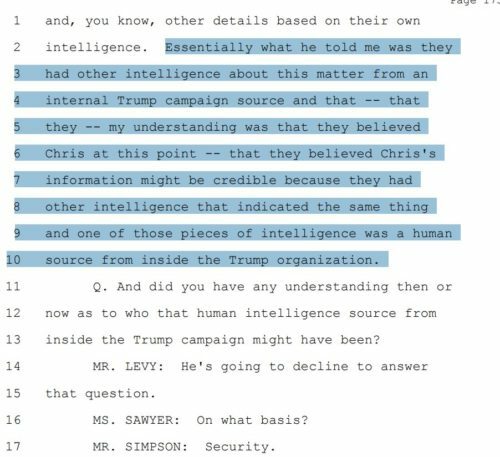 They know from Simpson’s testimony, if they didn’t already know, that the investigation began with a source inside the Trump campaign. In spite of this, though, they repeatedly told the public that this whole investigation was nothing more than a Democratic witch hunt intended to damage the Trump administration politically. It’s absolutely shameful, if not illegal, and every Republican current serving in Congress should be immediately driven from office. They put tax cuts for their wealthy donors before the security of their country, and they should be made to pay dearly for that decision. 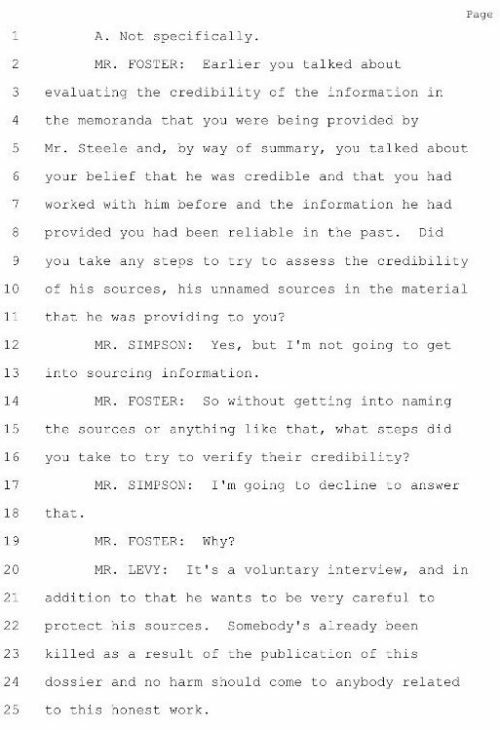 Josh Levy, the attorney for Fusion GPS, who accompanied Simpson to his August 22nd appearance before the Senate Judiciary Committee, mentioned during the course of the 10 hour session that “somebody’s already been killed as a result of the publication of this dossier.” I, for one, would be interested in knowing to whom he’s referring. I could go on forever with this stuff, but I really need to sleep… Good night, my invisible friends. This entry was posted in Politics, Uncategorized and tagged Alexander Downer, Australia, Barack Obama, Bill Browder, blackmail, Christopher Steele, collusion, Democratic National Committee, Department of Justice, Diane Feinstein, dossier, FBI, Fusion GPS, George Papadopoulos, Glenn Simpson, Hillary Clinton, HUMINT, intelligence community, James Comes, John McCain, kompromat, Magnitsky Act., MI6, opposition research, Orbis Business Intelligence, Orbis Report, organized crime, Robert Mueller, Russia, Russiagate, sanctions, Senate Judiciary Committee, Sergei Magnitsky, Washington Free Beacon. Bookmark the permalink. Post a comment or leave a trackback: Trackback URL. This is great. I didn’t know the history of Simpson and Russia. I also didn’t know that the accusation of murder entered this. Although Steele has been very careful. Of course it involves the Russians, and the Russians are known to simply off anyone who threatens them, like a bad Spy movie… or a totalitarian state. To be fair to the GOP, Obama also had that intel. And chose to do nothing. 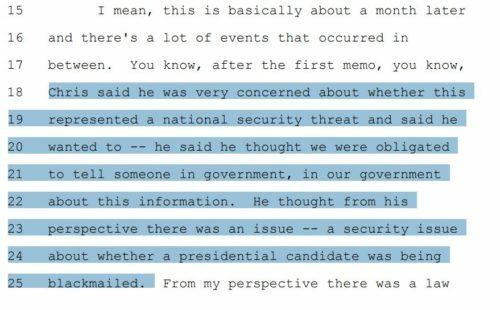 Because he didn’t want to be seen as interfering in an election, so as to protect the legitimacy of that election… which was to be of Clinton. Remember in a land far away, no one thought Trump would win? Did you read the Daily Beast piece last night where Grassley said that Simpson is the real Russian operative? Trump also got on Twitter and begged the Republicans to assert themselves and stop the investigation. “As democracy is perfected, the office represents, more and more closely, the inner soul of the people. 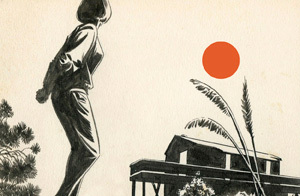 We move toward a lofty ideal. On some great and glorious day the plain folks of the land will reach their heart’s desire at last, and the White House will be adorned by a downright moron.” – H. L. Mencken, 1920. Simpson’s House testimony is now also available.